My office is located in Coquitlam, BC in the Bank of Montreal building located at the corner of Austin Avenue and Nelson Street. Use the entrance at the back of the building facing Ridgeway Avenue. Free parking is available on the street or in the underground parking lot that is accessable from Austin Avenue. My nine years experience in dealing with legal documents as an employee of the New Westminster Land Title Office has prepared me to specialize in all real estate transactions, including purchases, mortgages, re-finances, subdivisions, and stratification of land. As a professionally trained Notary Public, I can offer you advice on non-contentious legal matters. Call me today for a consultation at 604-492-2999. My fees are available upon request. 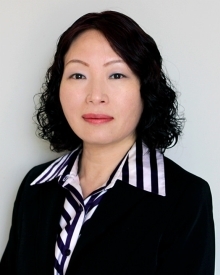 Molly Xia began her career as a Notary Public after attaining her master’s degree in Applied Legal Studies from Simon Fraser University. She also holds a Bachelor of Engineering degree in Photogrammetry and Remote Sensing and a Master of Engineering degree in Geographical Information Systems from Wuhan Technical University of Surveying and Mapping in China. After moving to Canada in 2007, Molly continued her education in Geomatics at the BC Institute of Technology. Prior to her becoming a Notary Public, Molly spent 9 years as an examiner of title for the Land Title & Survey Authority of BC where she gained extensive knowledge in the practical and legal principals of real estate documentation, including the subdivision and stratification of real property. Molly is fluent in English, Mandarin and Cantonese. Her practice carries with it the values entrusted upon her by the Society of Notaries Public of B.C. My office provides a wide range of services. If you don't see what you require, please give me a call and we can discuss your needs. My fees are available upon request. Can I come and see you after hours or on weekends? Sure. Give me a call or send an email and we can arrange an appointment. A British Columbia notary public is a person that can provide non-contentious legal services and draft a wide range of legal documents. Their strength is in preparing accurate, reliable legal documents which is covered by an insurance plan that protects the public. A BC Notary must go through a rigorous training program and earn a Masters of Arts degree in Applied Legal Studies at Simon Fraser University. Upon successfully earning the degree, the Notary candidate must be approved by both the ‘BC Notary Societies Membership and Credentials Committee’ and the Supreme Court of British Columbia. In British Columbia, a notary is sanctioned and governed by the Notaries Act of BC. The regulatory body that oversees and establishes standards for this profession is the Society of Notaries Public of British Columbia. What's the difference between a Notary Public and a lawyer? Notaries and lawyers both provide legal services to the public. Notaries, however, focus only on non-contentious issues such as real estate, estate planning, and other documentation.Unlike lawyers, a notary does not go to court on behalf of our clients or provide services for disputes, such as family relations issues or separations and divorces. Both lawyers and notaries carry professional liability insurance. If I am unable to help you with your needs, I will, when necessary, refer you to a qualified lawyer. Not at this time. If you require a certified translation, you should find a translator who is certified by the Society of Translators and Interpreters of BC: www.stibc.org. Walk-ins are welcome. However, it is best that you do call for an appointment so that you do not have to wait until I finish up with another client. The fees vary based on the services required. Please give my office a call or email and we can discuss what your needs will cost. Why do I need a notary just to get a mortgage or re-finance? The mortgage must be secured by registering it against the title at the Land Title Office. The lender will not release the funds until I provide evidence that the charge was registered at the Land Title Office. I am buying a house. Other than the purchase price, what additional costs should I expect? Survey Certificate fee if your purchase includes a mortgage ? If purchasing a strata unit, the cost of certificates and other documentation ? Land Title registration fees ? Two or more persons may be registered on title at the Land Title Office as either “Joint Tenants” or “Tenants in Common”. When the owners of the land are registered as Joint Tenants and one of those owners dies, the deceased’s interest in the land automatically passes to the remaining Joint Tenants. This is known as the right of survivorship. If the owners of the land are registered as Tenants in Common and one of those owners dies, the deceased person’s estate must be probated and the land is distributed in accordance with the wishes of the deceased as set out in the will if there is one, or, if there is no will, the distribution is governed by the Wills, Estates and Succession Act. I am buying a house. What documents do I have to give you? Ensure that your realtor sends my office a copy of the purchase contract. If you are mortgaging your purchase, ask your lender or broker to send us the mortgage instructions. It is best that the purchase contract and mortgage instruction be provided as soon as possible. I am selling a house. What documents do I have to give you? Ensure that your realtor sends my office a copy of the sales contract. I just bought a house or am thinking of buying a house. Should I get my realtor to do a title search? As a buyer, it is prudent to fully inform yourself of all of the available information provided on the title to the lands. There may be charges registered on the title that could restrict what you can do with the land or where on the land that you can erect a structure. If your realtor cannot provide you with this information, please contact me and I will do the research for you. I need to place a builder’s lien on someone’s property. Can you do this for me? Yes I can. If you have made improvements on someone’s land and have not been paid for that work, a Builders Lien may be registered against the title to the land in accordance with the Builder’s Lien Act. Simply provide me with the details of the work provided and the legal description of the land. I was just awarded a judgement by the courts. Can I register that judgement on the debtor’s title? Yes you can and I can do it for you. Provide me with an original Certificate of Judgement that is issued by the appropriate court along with the legal description of the debtors land. Can you deal with a subdivision or stratification of my property? Yes I can. As a former Examiner of Title in the Land Title Office, I have nine years experience in the examination of survey plans and documents. My training and experience provides me with the practical and legal requirements regarding the subdivision and stratification of land. A Power of Attorney is a legal document that appoints at least one person or corporation to look after your legal and financial affairs for you while you are alive. What do you need from me to prepare a Power of Attorney? The first step is to complete a short questionairre and either email it to me or bring it to me at our first appointment. We will review the questionairre together, at which time I will gather all of the information that I will need in order to provide you with a Power of Attorney document that fits your needs. I have a Power of Attorney from my bank. Can I use it? No. A Power of Attorney issued by a financial institution is only operative for the specified transactions performed within that institution. For dealings outside that institution, you will require a legal Power of Attorney that is made pursuant to the appropriate legislation. I can assist you in preparing a legal Power of Attorney that is valid for all matters. I have a Power of Attorney from another Province in Canada, or another country. Can I use it in British Columbia? If the Power of Attorney is not enduring, then probably not as it will likely not meet the requirements of the Power of Attorney Act of BC. If the Power of Attorney is enduring, then maybe. It is best that I review the document so that I can provide you with an informed answer. You can choose almost anyone to be your Attorney. It must be someone that you can really trust as that person will be authorized by you to do anything with your finances or real estate that you can do on your own. Be someone whose honesty and judgment you can trust. Not be someone who provides personal care or health care services to the adult for compensation, unless that person is your child, parent or spouse. Not be an employee of a facility in which the adult resides and through which the adult receives personal care or health care services, unless that person is your child, parent or spouse. A Power of Attorney is a good tool that you would give your family or someone else that you appoint the ability to manage your affairs if you ever become unable to manage them yourself. If you don’t have a Power of Attorney and your finances are not held jointly, nobody will be able to deal with your financial obligations if you become infirm. Your rent and utilities cannot be paid and your home cannot be sold or mortgaged if your situation requires more funds. Generally, your attorney can do almost everything that you can do in terms of making legal and financial decisions on your behalf. You can specifically state in your Power of Attorney document what duties that your Attorney can perform, or not perform. For example, you can state that the Attorney’s powers are restricted to all matters related to the sale of a particular property. Or you can state that the Attorney’s has all powers except may not mortgage any property that you own. An attorney cannot make a Will for you. I have a Will, so why would I still need a Power of Attorney? A Power of Attorney is only useful while you are alive. A Will will take effect only upon your death. What are the consequences if I don’t have a Power of Attorney? The Public Guardian and Trustee will manage your affairs, or the BC Supreme Court will appoint a family member or a friend to manage your legal and financial affairs. That person is called a Committee. Once I die, will my Power of Attorney still be in effect? No. A Power of Attorney ceases to be effective upon death. After three years, unless the Power of Attorney is enduring or if there is an expiry date explicitly stated in the Power of Attorney document. If the Power of Attorney is terminated by an act of the court. If the attorney resigns in accordance with section 25 of the Power of Attorney Act. Is the adult's spouse and their marriage or marriage-like relationship ends. Is a corporation and the corporation dissolves, winds up or ceases to carry on business. Is convicted of a prescribed offence or an offence in which the adult was the victim. Note that if you have multiple attorney's or have appointed an alternate attorney, some of the attorney cessation reasons listed above may be negated. An enduring Power of Attorney is valid even if the Adult were to become incapable of managing his or her own affairs. A Power of Attorney that is not expressly stated to be enduring is only valid while the person is capable of making his or her own decisions. I don’t want to give my attorney the power to be able to do everything? What should I do? Generally, a Power of Attorney allows an attorney to do almost anything that you can do. However, you can be specific in your Power of Attorney document as to which duties your attorney may perform. For example, you may only allow for the sale of a specified piece of real estate. Or you may allow the attorney to perform a specified duty within a specific time frame. Can my Attorney make health care decisions for me? No. You may appoint someone to make medical decisions on your behalf by way of a Representation Agreement. This agreement is created to ensure that your wishes for health care are met. Yes, you can. You will specify in your Power of Attorney document whether your multiple Attorneys must act together or may act separately. What should I do with my Power of Attorney once it is signed? The original of your Power of Attorney is required by the Attorney when he/she needs to act on your behalf. You can give the document to your Attorney now, or inform him/her of the location of the document. In any case, it should be kept in a safe place. The original Power of Attorney may be filed in the Land Title Office now for future use. The Registrar of Land Titles will, if you wish, make a certified true copy for the filing and give the original back to you. By making a Will, you are in control as to what happens to your estate and who administers that estate when you die. Without a Will, your estate is distributed in accordance with the Wills, Estates and Succession Act. What happens when I die if I have a Will? If you die and have a Will, your Will will be probated. Your appointed executor will then administer the estate in accordance with your wishes. However, if your assets are in Joint Tenants, those assets are transferred to the surviving Joint Tenant(s), negating the need for probate. If you die without a Will, your estate will be probated and the courts will appoint an administrator. The administrator must administer the deceased estate in accordance with the Wills, Estates, and Succession Act. Does the government take my estate if I die without a Will? If you die without a Will and have absolutely no heirs as defined in the Wills, Estates and Succession Act, your estate will pass to the government. This is very rare as there is usually at least one heir to pass the estate to. If I don’t have a Will and I die, what happens to my children? A legal guardian will be assigned by the court. Your executor should be someone that you can trust to manage your affairs in the manner that you want them managed. As the role of an executor can be time consuming, that person should be someone who lives in close proximity to you. It is not advisable to appoint someone who lives in another Province or country. The person that you choose must also be willing to take on the responsibilities involved in administering your estate. Yes. Any changes to your wishes or changes to your current marital status (marriage, divorce, separation) will result in the necessity of a new Will being drafted. When I sign my Will, does my signature have to be witnessed, and if so, by who? Your Will must be signed by you and your signature must be witnessed by two persons who are at least 19 years of age. You and your witnesses must be present when the Will is signed and observe each other signing. Your witnesses must not be someone that will benefit from your Will, either directly or indirectly. What makes a Will a Valid? be signed in the presence of at least two witnesses. How long will it take to make a Will? A Will will generally take a few days to draft. We will meet and you will provide me with all of the relevant information. Before your first visit, you may complete this short questionnaire to expedite the process. At this meeting, I will discuss with you the law relating to Wills and estate planning and your options. We will have another meeting in a few days at a time that is convenient for you where we review the draft Will. If you are satisfied, the Will can then be signed. I would like to make a Will. What information should I bring to my appointment? The following information should be brought in to properly prepare your Will: (You may complete the following questionnaire to expedite the process). Any previous wills that you have made. The executors full legal name and address. If you wish appoint an alternate executor, provide that persons full legal name and address. The full legal names and addresses of the beneficiaries. A description of any specific gifts that you may want to leave to your beneficiaries. If you have minor children, provide the full names and addresses of the person that you wish to designate as guardian. If you have any specific funeral wishes, provide that information. What should I do with my will once it is signed? The original of your Will will be required for probate. You should keep your will in a very safe place, like a bank safety deposit box or your personal safe. You must ensure that your executor is aware of the location and has access to the Will when needed. The Vital Statistics Agency maintains a Wills registry in BC. You can file a notice with the registry specifying the location of your Will. A Representation Agreement is a document that allows you to authorize one or more personal supporters to be your representative to help you manage your routine financial affairs and, if necessary, to make decisions on your behalf in case of illness, injury, or disability. Creating a representation agreement avoids the need for the court to appoint someone to help adults make decisions, or someone to make decisions for adults, when they are incapable of making decisions independently. What types of Representation Agreements are there? An agreement that contains non-standard provisions under section 9 of the Representation Agreement Act. What is the difference between a Representation Agreement that contains standard provisions and non-standard provisions? The short answer is: A section 7 agreement is for most health care and most legal and financial decisions. It cannot grant authority for preservation of life decisions. obtaining legal services for the adult and instructing counsel to commence proceedings, except divorce proceedings, or to continue, compromise, defend or settle any legal proceedings on the adult's behalf. The short answer is: A section 9 agreement is for all health care decisions. despite any objection of the adult, physically restrain, move and manage the adult and authorize another person to do these things, if necessary to provide personal care or health care to the adult. What financial affairs can my representative manage? Your representative can manage routine financial affairs, the list of which is quite lengthy. A complete list is set out in Section 2 of the Representation Agreement Regulation. How is a Representation Agreement different from a Power of Attorney? A Representation Agreement does not give your attorney the power to deal with real estate while a Power of Attorney does. A Power of Attorney does not allow your attorney to make decisions regarding your health care, but a Representation Agreement does. Who should be my representative? Your representative should be someone that you trust, someone that lives close to you, and someone that is capable of making the appropriate decisions required on your behalf. That person must also be at least the age of 19 years. Who cannot be my representative? cannot be your representative, unless that person is your child, spouse, or parent. When does a Representation Agreement become effective? A Representation Agreement becomes effective either on the date it is signed by the adult and witnesses, or at the time that an event that is specified in the agreement occurs. When does a Representative Agreement end? when the adult becomes a Patient under the Patients Property Act. Note that a Representation Agreement may not end in 3, 4, and 5 above if the agreement names an alternate representative. What should I do with my Representation Agreement once it is signed? The original of your Representation Agreement is required by your representative when he/she needs to act on your behalf. You can give the agreement to your representative now, or inform him/her of the location. In any case, it should be kept in a safe place and your Representative should have easy access to it when it is needed. What is notarizing a document? Notarizing a document is the act of authenticating the signatures that appear on the document. When I notarize a document, I must be absolutely certain that the signature of the person that I am witnessing is in fact made by the person signing the document. You must provide two pieces of ID proving your identity. What type of documents will you notarize? Can you certify a document for me? Yes. If you require a certified true copy of a document, you must bring the original of that document in to my office. I will certify a photocopy of your original document as being a true copy of the original by affixing my signature, seal and statement to that effect on the copy. Monday to Friday 9:00am to 6:00pm. Appointments are available on request for after hours. Translink bus route 152 stops in front of my office building. Look for the Bank of Montreal on the North side of Austin. The entrance is in the back of the building. Free parking is available on Ridgeway Avenue or in the underground parking lot that is accessable from Austin Avenue. Disclaimer: The contents of this website are for informational purposes only and are not to be construed as legal advice. © Molly Xia Notary Corporation* All Rights Reserved. Page created by DL Guy.